A little something that has been in the works for a few months. 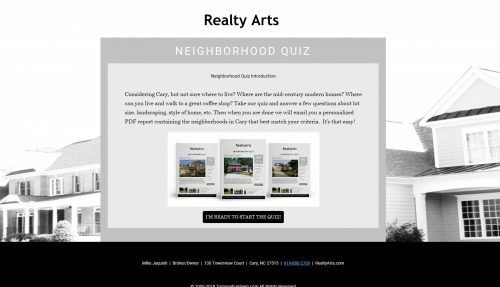 Using a selection of neighborhoods, and the features and amenities commonly available, we have produced No Hassle Neighborhood QuizNo Hassle Neighborhood Quiz. You will answer 10 questions about location, features, neighborhood amenities, house styles, schools, etc, and we will email you a report. The report includes a few neighborhoods, each graded as to how well they fit your quiz input. Yes, we need your email address to send you the report. No Hassle style. That is, we don’t hassle you, don’t put you on a spam email marketing list, don’t pester you routinely. If you want more information, complete the quiz, and click the “More Info” button, or just Contact Me. Next PostNext Sold. July 2, 2018. 202 Giverny Place, Cary NC 27513 is an Immaculate home with the original owners.